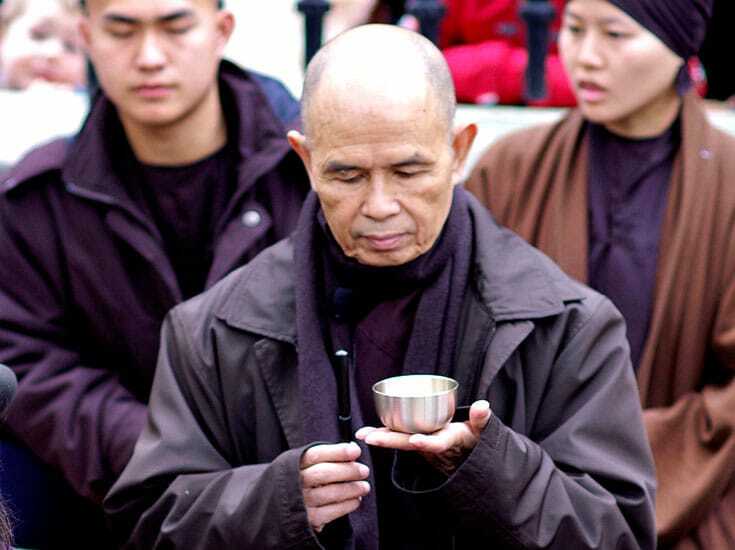 In this exclusive interview, Thich Nhat Hanh reveals details about his family, sheds light on a little-known Buddhist master, and explains how—if you have mindful ears and mindful eyes—the Buddha is always teaching. Throughout my retreat at Blue Cliff Monastery, I was curious about the quaint little brown house, which the monastics referred to as Thay’s hut. Finally, on the last day, I was invited inside and saw a cozy room brightened with fresh orchids, an image of the Buddha touching the earth, and a candlestick filled with white tapers and decorated with birds. Thay was seated at a rustic table, low to the ground, and I was ushered to a cushion beside him. During our interview, he revealed personal details about his family, uncovered the remarkable history of a little-known Buddhist master, and explained how—if you have mindful ears and mindful eyes—the Buddha is always teaching. Partway through our conversation, Jo Confino of the British newspaper The Guardian joined us, and the conversation turned to how meditation practice can benefit business leaders, organizations, and society. As you read the interview, please keep in mind that there is one thing that didn’t make it onto the page, and that is Thich Nhat Hanh’s frequent, joyful smile. What is the role of a teacher in spiritual practice? A friend can be a teacher, a fellow practitioner can be a teacher, and you yourself can be a teacher. A teacher is anyone who helps you practice and find more freedom—even freedom from your teacher. You have to be intelligent and not be dependent on your teacher. If you follow him or her with blind faith, it’s not good. There is no perfect teacher. You can learn the good things from him or her, and you can also help your teacher to be better. Very soon there will be a teacher within you, and you can follow that teacher. You are not lost when your teacher is no longer in human form, because your teacher is always alive in you and in his disciples. When I practice calligraphy, sometimes I invite my late teacher to join me, so as teacher and disciple we do it together. Breathing in, half the circle. Breathing out, the other half. When I smile, my teacher smiles. I invite all teachers of the past to do a circle with me, and I know that my hand is not my hand. My hand is also my father’s hand and my mother’s hand. Sometimes I invite all my friends to do it with me, because they are me also. Will you tell me a little about your father? My father was an officer in the royal army. At that time in Vietnam, the king and his government were controlled by the French, so my father’s main job was to go and search for areas where poor people could resettle. He liked to do that. From time to time, I would go with my mother and visit him, far away in the mountains. My father bought a bell and some sutras and tried to recite them. He wanted to practice Buddhism, but he was very busy and did not succeed. I feel good because I do it for him. I can do this because we all are the continuation of our fathers, our mothers, our ancestors. This is true. When you do walking meditation, they walk with you. If you take peaceful, happy steps, they also do. You do not have a separate self, so you can practice for all your ancestors. If you encounter the dharma and experience transformation and healing, all of your ancestors profit from your practice. So my father and mother in me are very happy. This week, you mentioned that your mother had a miscarriage before she had you. You said that as a child you thought the baby she lost was you, and that she miscarried because you weren’t ready to be born yet. I was wondering what your opinion of that lost baby is now. Does a baby who dies before it’s born continue in any way? The baby has no separate self. The self of the baby is made of the mother, the father, and other elements. So these elements will come together again, and the next baby is neitviether exactly the same nor a different one. If you suffer from losing a baby, it’s because you are caught in the notion of self. It’s the insight of no-self that can liberate us from grief. You have no-self and that tiny baby has no-self. It’s like when you try to build a sandcastle. If conditions are not good, the sandcastle will collapse. You can build the castle again, but you cannot say this is another castle, because it’s made from the same materials. Nothing is lost. Can you tell me a little about Zen in Vietnam? Does it have a particular flavor or character that distinguishes it from the Zen practiced in other countries? There was a Buddhist teacher in the first half of the third century who was born in Vietnam and became a teacher of meditation. His name was Tang Hoi. He was a historical person, not like Bodhidharma, who is traditionally credited with bringing Zen to China in the sixth century. A lot of things have been imagined or invented about Bodhidharma’s life, but Tang Hoi left behind his writings, which are still preserved. Our Zen is a continuation of what Tang Hoi taught. In Vietnam, there is a tendency to always go back to the original scriptures. When Master Tang Hoi taught meditation, he mostly used the sutras of original Buddhism but taught them with the spirit of Mahayana Buddhism. So in Vietnam, we profit from this. We never fly too high and lose the roots. Meditation practice in Vietnam is also very engaged in society. We have had kings who practiced meditation and invited teachers to come to their palace. They always had a meditation hall in the palace and made good use of the teachings and practice in their political life. One king in the thirteenth century abdicated in favor of his son and became a Buddhist monk. He took care of the spiritual aspect of the nation and his son took care of the political aspect. He travelled to the Hindu kingdom of Champa in central Vietnam and made peace. He walked the country barefoot and taught people how to practice the five precepts and abandon superstitious practice. So in Vietnamese Buddhism, politics and spirituality support each other. Spirituality is not cut off from the world. Meditation is not a place where you hide yourself. Why is it important for Buddhism to evolve? Society has changed. Young people have a lot of suffering, a lot of doubt. If you want them to ponder the sound of one hand clapping or ask them if a dog has buddhanature, they cannot stand it. If you continue to teach like that, you lose people. Buddhism has become marginal in Korea and Japan because that is what they are doing. 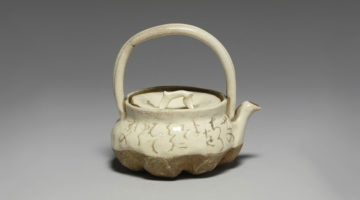 Throughout the history of Buddhism, teachers tried to offer the teachings in such a way as to respond to the needs of their time. If they invented silent illumination, if they invented koans, it was because at that time those things worked. But when these things do not work anymore, why cling to them? Our practice has to respond to the suffering of modern people. That’s why teachings on communication and reconciliation are important. These teachings are easier for people to understand, even children. But that does not mean these teachings do not have a strong Buddhist base. Their foundation is in no-self, impermanence, interbeing. We have to be intelligent followers of the Buddha. We have to make good use of the teachings. We have to present the teachings and the practice in such a way that people can make use of them and transform themselves. As I said, Vietnamese Buddhism is very close to original Buddhism, but we make good use of the spirit of Mahayana. There are a lot of wonderful things in Mahayana Buddhism. For instance, in original Buddhism the Buddha’s body is the nirmanakaya, his human form. But in Mahayana, the Buddha’s real body is the dharmakaya, the body of ultimate truth, and that body never dies. So if you know how to listen mindfully, the Buddha never stops teaching. The Earth is a beautiful expression of his teachings. The wind, flowers, and trees continue to teach impermanence and no-self. That is the body of the Buddha—the body of truth that never dies. So if you have mindful eyes and ears, you continue to see the Buddha. This corresponds to the notion that the kingdom of God is available in the here and the now. We could even help Christians change the notion of the kingdom of God. God can be the dharmakaya, the true body of the Buddha. Some people say that once someone reaches enlightenment, they no longer produce karma. What do you think of that? Karma is action. When you produce a thought, that’s karma, either good or bad. When you say something, that’s karma. When you do something, that’s karma. When you are enlightened, your karma can only be good karma. You have no discrimination, no anger, and no fear, so what you think, what you say, and what you do can only bring good results. The end of samsara means the end of negative things. Why would we wish good things to stop? We want good things to continue. Our practice is to have the good things continue for a long time. That’s good karma. If you look at the Buddha, you see he is still operating. He’s teaching, he’s doing, because his disciples are his continuation. So the Buddha is still producing karma—good karma! So you cannot say that the Buddha, because he is enlightened, has stopped producing karma. That’s not true. In Buddhism, the Buddha, the community of practitioners, and the teachings are known as the three jewels. How do we relate to them? The three jewels are inside of you. You have the Buddha in you. It is your capacity to wake up, to understand, to love. If someone has plenty of these things, he or she is a Buddha, and we want to have as many buddhas as possible. You have the dharma in you. There must be a method to produce compassion, understanding, and freedom, and that is the dharma. The dharma in you may be weak or strong, according to your practice. Then, in order to produce the powerful energy of enlightenment, compassion, understanding, you need a sangha, a community. You build a sangha and together you help each other nourish the Buddha and the dharma in you. The three jewels are very concrete. They are not objects of belief. You cannot deny the existence of the three jewels. They are not something outside of you. They are inside of you. The Buddha is not on a cloud. The Buddha is awakening, understanding, and compassion, and you have buddhanature. Practice helps buddhanature grow and that protects you. That is your refuge. It’s very scientific. There is a Buddhism of devotion, in which people think of the three jewels as outside of themselves, as being above them or beyond them. That belief helps them. But there is a deep Buddhism—a Buddhism of practice—where you can generate the energy of the Buddha for yourself and for your community. There is a tendency to lose deep Buddhism for devotion Buddhism, so we should try to help the Buddhism of practice last. Otherwise, Buddhism becomes a religion like other religions, which are about relying on a superior power to save us. As part of your North American tour, you’re going to meet with the CEOs of some leading technology companies. What do you think of business leaders and employees learning meditation? We don’t have to worry whether meditation is being misused to make money. Meditation can only do good. It doesn’t just help you calm your own suffering. It also gives you more insight into yourself and the world. If your business is causing environmental problems and you practice meditation, you may have ideas about how to conduct your business in such a way that you will harm nature less. When you experience the wisdom brought about by meditation, then naturally you want to conduct your business in a way that will make the world suffer less. So don’t worry about whether meditation is serving a wrong cause. It can change a wrong cause to a good cause. How do you view competition in business, politics, and our personal lives? Many of us believe that you can only be happy when you leave other people behind, when you are number one. But you don’t need to be number one to be happy. [Laughs] I don’t want to be number one. We have to reconsider our idea of happiness. Even if you are successful in making more money, you still suffer. Maybe your competitor doesn’t make as much money as you do, but they are happier. So do you choose to be happy or to have the other kind of success? To be happy is the real success. When you are happy, you don’t need to compete anymore. You compete because you are not happy. The practice of meditation can help you suffer less and be happy. In our society, it feels like everything’s speeding up and people are feeling overwhelmed. The problem is that people believe that happiness is in the future. But if you stop speeding and running, you can find happiness right in the here and the now. There is no true happiness without peace. If you continue to run, how can you have peace? We are running away from ourselves, our families, and nature. That is our society today. We are afraid of going home and taking care of ourselves. We do not have the time to take care of our beloved ones. And we do not allow Mother Earth to heal us. We lose ourselves in our little devices. But companies could use their intelligence and goodwill to create instruments that help us go home to ourselves and heal ourselves. Suppose I could wear something that would detect when there’s too much adrenaline in my blood. It would produce the sound of a bell, which would help me stop and breathe in and out. That would help me. It would remind me: You have a strong emotion. Stop doing what you are doing, embrace your emotion, and find out where it has come from. That kind of electronic device would help me go home to myself rather than lose myself. So we don’t have to reject or throw away all devices. Rather, we can make good use of them. I myself have a “Now watch.” When I look for the hour, it always says “Now.” I can put this watch to my ear and breathe in and out, according to the sound. Usually I take four seconds for an in-breath and six seconds for an out-breath. I stop thinking and just enjoy my breathing. So I make good use of a very simple device. But they can also make more sophisticated things to help me practice. How do we find a positive purpose for our lives? Everyone wishes to do good, because all of us have buddhanature. When you have found a way to do good, you are at peace with yourself and happiness becomes possible. But you have to use your own intelligence to find a way. The good way, the right way, is the opposite of the bad way. The bad way has been bringing you suffering. Instead of wrong view, you want right view. Instead of wrong thinking, you want right thinking—thinking with compassion and understanding. When you look at the path that is not noble, you can see the other path. So looking into suffering, you see the way of happiness. That’s the teaching of the four noble truths. You don’t need to be a Buddhist to understand them. You just need to take the time to look into your own suffering and happiness. A student may think that he cannot be satisfied until he gets his diploma. But when he gets the diploma, he is only happy for a few days before he says, “I need to get a job and a house.” So, nothing can satisfy a person if he is always running. Stopping and learning to be happy in the present moment is the key. We call this aimlessness. It is enlightenment. So a student can be very happy even if he has not got his diploma. There are always conditions for happiness in the present, but maybe you don’t know how to enjoy them. You don’t recognize them and you look for happiness in the future. Buddhism is the teaching of waking up. Our society needs a collective awakening in order to save ourselves from our crises. So the practice is that awakening should take place in every step, everywhere. If you have awakening, you know that you have a path of happiness. You stop suffering, and you can help many other people do the same.